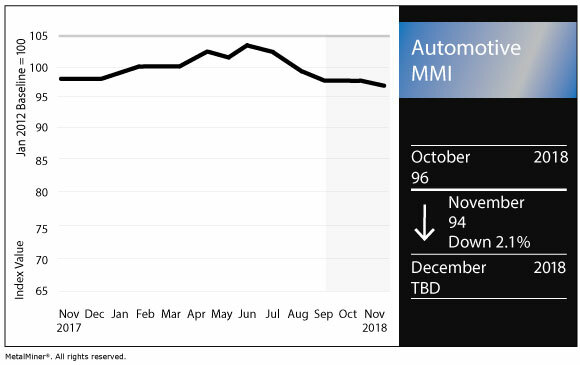 The Automotive Monthly Metals Index (MMI) fell 2.1% this month, down to an MMI reading of 94 for November. It’s quarterly earnings reports season once again. Last week, General Motors reported its third-quarter earnings, posting third-quarter revenue of $38.5 billion, up 6.4% compared with Q3 2017. It also reported EBIT-adjusted income of $3.2 billion, up 25% year over year, and income of $2.5 billion. GM saw North American sales of 833,712 units. Meanwhile, within the U.S. GM delivered 700,000 vehicles at an average transaction price of $36,000, up about $800 year over year and $4,000 above the industry average. The North American sales total for the quarter, however, was down 9.8% compared with Q3 2017. Ford Motor Co. also recently reported its Q3 results, posting net income of $1.0 billion. 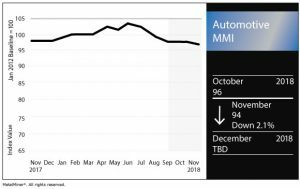 In October U.S. sales, Ford saw a 3.9% year-over-year decline, even seeing a 4.9% drop in its truck sales. However, SUV sales rose 6.7% year over year. Like GM, Ford saw an increase in average transaction prices. Ford’s overall average transaction price reached $36,800 in October (up $1,400 from last year). Last week, Ford announced a two-year autonomous vehicle project with China’s Baidu, Inc.
Fiat Chrysler this week reported U.S. sales of 177,391 vehicles in October, up 16% year over year. Honda saw its total sales drop 4.1% year over year in October. Honda truck sales in the U.S., however, jumped 6.5% year over year, while cars fell 14.5%. Nissan’s October sales were down 10.6% in October year over year, with a 15.4% jump in INFINITI sales and a 13.0% drop in Nissan division sales. Toyota’s October U.S. sales rose 1.4% by volume, but fell 2.2% on a daily selling rate basis. 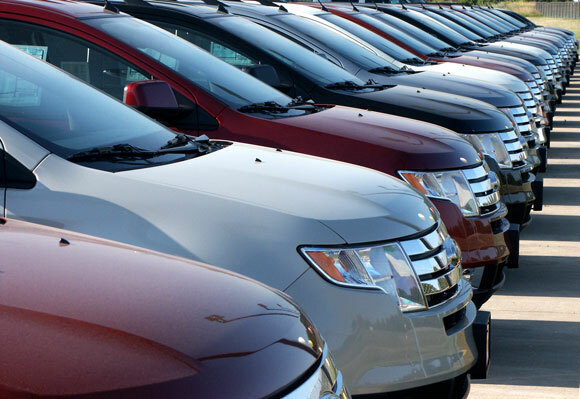 Overall, auto sales in October were up 0.4% year over year, according to Automotive News. However’s GM’s Cadillac brand also performed well in China. Cadillac sales were up 4% year over year in the third quarter and are up 20% in the year to date. In September, auto sales in China fell by the greatest amount in seven years, Reuters reported. According to a phys.org report, an E.U.-funded project has developed an alternative heating system for electric vehicles (EVs) that would help reduce energy consumption and improve EV range. U.S. HDG steel fell 1.9% down to $1,003/st. Meanwhile, the platinum-palladium spread narrowed slightly this past month. U.S. platinum bars rose 2.6% to $835/ounce, while palladium bars fell 0.3% to $1,067/ounce. U.S. shredded scrap steel dropped 2.3% to $342/st. Following last month’s surge, LME copper retraced, dropping 2.6% to $6,180/mt. Chinese lead rose 0.5% to $2,692.21/mt. Korean aluminum coil dropped 4.2% to $3.61/kilogram.